A Digimon that resembles an ancient dinosaur that existed in the prehistoric world. It sweeps everything away with its two well-developed arms and its gigantic tail. It is extremely easy to tame due to its intelligence and docile personality. For that reason, it is highly valued by beginner Tamers, and is often raised with care. You could probably say that it is a representative figure of the most basic Digimon. 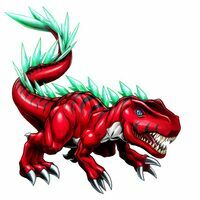 Its Special Move is spewing out deep crimson flames the same color as its body (Fire Breath). The primeval data engraved into its Digicore has been drawn out, transforming it into a figure whose fierce, dinosaur-like traits are more pronounced. As both its power and speed have increased due to it gaining more muscle mass, it is harder to tame Tyranomon compared to before. The ridge along its back has grown to become beautifully transparent yet sturdy, just like gemstones, and can now even be used as a weapon. Its Special Moves are curling its entire body up, charging at tremendous speed, and mincing any enemy that passes it by with the ridge on its back (Crash Rolling), in addition to "Crimson Breath", an enhancement of the original "Fire Breath". Its fierce, dinosaur-like traits are more pronounced, and both its power and speed have increased due to it gaining more muscle mass. The ridge along its back has grown to become transparent, beautiful and sturdy, just like gemstones, and even turns into a weapon. It attacks with the enhanced "Crimson Breath" and "Crash Rolling", where it curls its entire body up, charges and minces things. | Tyrano is a corruption of tyranno, from Tyrannosaurus rex (「ティラノソーラスレックズ」 Tiranosōrasu rekkuzu), one of the biggest carnivorous dinosaurs. Crimson Breath  クリムゾンブレス Kurimuzon Buresu An upgraded version of its original Fire Breath. Spews deep crimson flames that are the same color as its body. Crash Rolling  クラッシュローリング Kurasshu Rōringu Curls its entire body up and rush forward at tremendous speed, then slices up any enemy that approaches with the ridge on its back. ↑ Tyranomon X-Antibody's initial artwork was illustrated by Moriyama Soh. This page was last modified on 17 April 2019, at 05:44.